We are located on the east side of Blackstone Ave, just north of Shaw Ave, in front of Tornino's Banquets. Only Chesterfield's Insiders get early access to our biggest sales and exclusive deals no one else knows about! To become an Insider, just enter your info below, click the button and you're in. It's free! Join the best group of antiques dealers in Fresno! Chesterfield's currently has openings for a couple of additional antique dealers. For more information, contact us. Your sales people are outstanding. They were such a pleasure and so helpful...It felt like I was dealing with friends. Sam and Sandy did an excellent and highly knowledgeable job evaluating and selling the large and unique collection of antiques and collectibles in my mother's estate. Always cheerful and helpful, they went far beyond what other estate consigners would have done and I could not have readied my mother's house for sale without their help. 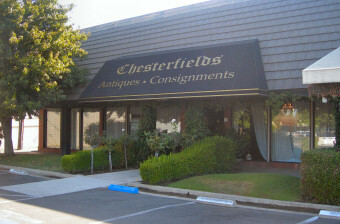 Chesterfield's is clearly Fresno's best choice when it comes to estate sales and consignments! Sam has an extremely talented eye for interior decorating. She intently listened to our preferences and exquisitely decorated both our living and family rooms. Sam's talent in combining antiques from all over the world, along with a few new items here and there, allows her talents to shine in our home everyday. I will surely shop at Chesterfield's every chance I get! All materials on this website © 2011 - 2019 Chesterfield's Antiques and Consignments, unless otherwise noted.